Why its essential for you to know Hebrew. Hebrew -- knowledge of the language of the Jewish people is essential. Jews pray in Hebrew, and therefore should know the words they say. The Torah is in Hebrew, and its better to understand it in the original. Hebrew is the international language of the Jewish people and in all the places I've been around the world, Hebrew works better than English. And...many of the blog posts I simply don't have time to write, are based on sources in Hebrew. These stories would fascinate you, yet I simply do not have the time to translate them all for you. For example: Maariv reports on how the JNF has capitulated to Leftist demands to stop planting trees in the Negev, despite the land being 100% State of Israel land and upheld by the courts. So what can we expect from Israeli Arabs and not be considered crazy? Sometimes, one decision can make the difference between making history and becoming a footnote. 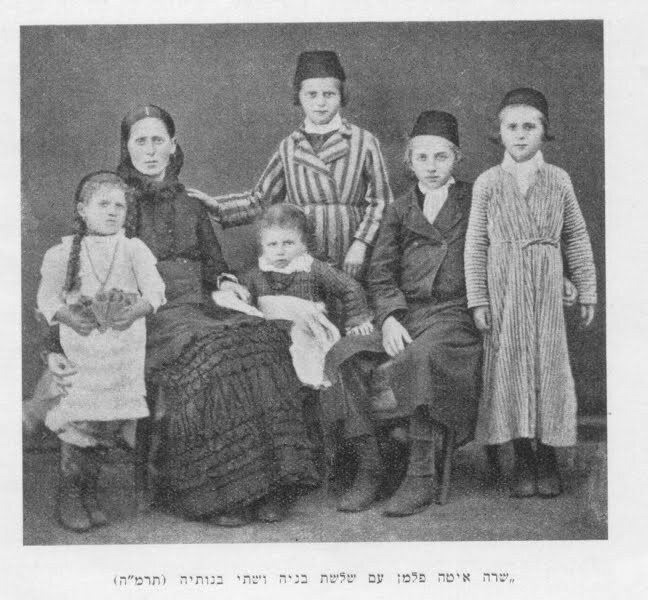 Dov David Fellman, a businessman from Mezritsh (Mezhirichi ), came to Israel in 1883, on a pre-Aliyah trip. He toured the land, visited the existing Jewish villages of the time, and decided to start off his own farm, and so set an example for others. Becoming an Ottoman citizen so he could buy his own land, he bought 10 acres in the Arab village of Sumeil. 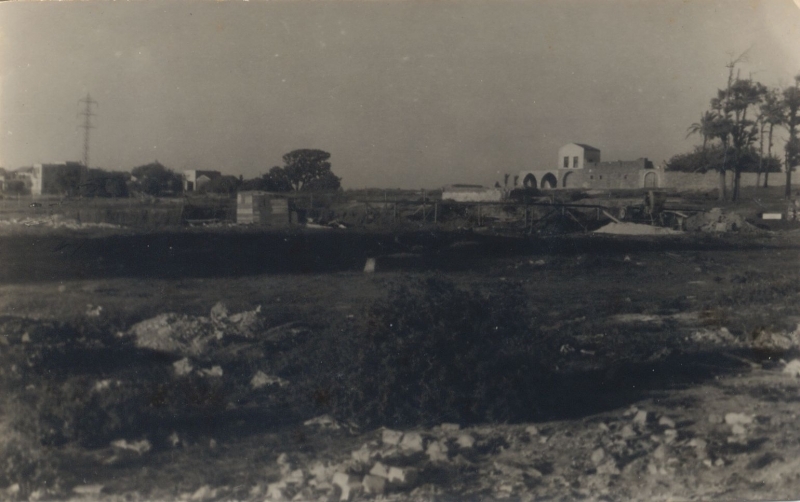 Sumeil, more than an hour's donkey ride from the Jews of Yaffo, was located in what is today the 'old North' of Tel Aviv, between the streets of Ibn Gabirol, Alrozorov and Shlmo Hamelech. 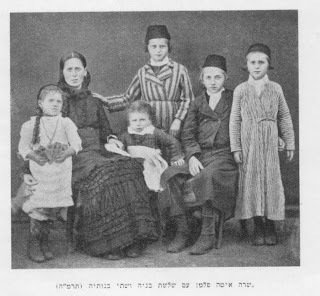 In the winter of 1884 he brought his family to Israel - his mother, his wife Sarah Itta (his second marriage), and his seven children (ages 17 to 1). They were accompanied by R' Baruch Meir Rozenblum, teacher and butcher, and by the family's maid. David Fellman wanted to be prepared, and so he bought a few books before boarding the boat, and on the way over taught his family Arabic and read up on farming and agriculture. On their new homestead the family planted an orange grove and on the rest of the land they planted wheat, barley and vegetables, and had cows and chickens. David would start off every day with his morning prayers and learning Mishnah, he would then go to Yaffo to sell his produce, come back, work in the fields with his two eldest sons, and end the day with the evening prayers and a page of Gemarah. The Fellmans faced many hardships that winter, but the hardest for David was that, due to the Shabbat travel limits, he could not pray in a minyan (quorum) on Shabbat. Together with R' Meir he studied the Halacha and possible solutions. They went out to measure the 'techum shabbat' distances, but Yaffo was simply too far away. The first 'techum shabbat' ended on what is today Hamelech George street in Tel Aviv. The second ended where the neighborhood of Neve Shalom was later built. But he was willing to put up with everything for his belief that this was his contribution to Redemption, and that once he blazed the trail, others will follow. That summer, disaster struck. David Fellman died from misdiagnosed heatstroke. A few weeks later, the baby daughter died of malaria. 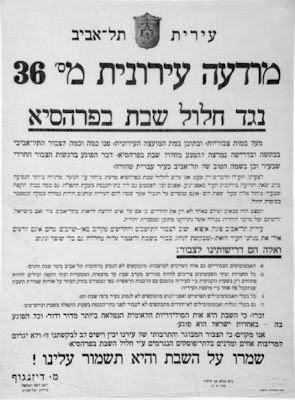 Well wishing rabbis tried to convince the new widow, just 27 years old, to go back home to Mezritsh. Rabbi Diskin of Jerusalem told her: "I've never told a Jew to leave Israel, but my advice to you is to leave. You're a widow with six orphans!" But Sarah Itta was determined to stay on the farm, her husband's dream and legacy. This was the land for which he died, and this was where she was going to stay. Life was very difficult, but nothing deterred Sarah Itta. The farm was in debt, so she sold off her jewelry and got a loan from Rothschild. With time and effort the orange grove became a profitable business. Sarah Itta even surprised Rothschild by returning the loan. When Baruch Meir Rozenblum, the children's teacher, left for other endeavors, she brought in other Torah scholars: Rabbi Shaul Shaulzon from Hebron and Rabbis Dov Marcus and Nachman Gedalia Broder from Jerusalem. The latter, who came with his wife, later became known as an authority on the Etrog. The Fellmans became the national experts on orange growing. In 1989, when R' Aryeh Lev Frumkin planted the first orange grove in Petah Tikva, he bought the saplings from the Fellman farm. The Fellman sons helped out in the orange groves of Petah Tikva, Hadera and other Jewish villages. In 1891 the eldest son, Aharon Lev Fellman, wrote "Ma'ayan Ganim", the first (Hebrew) book on orange growing (available online as PDF). The Arabs of Sumeil had a lot of respect for their new neighbors. When they first arrived, the village sheik, Muhammad Abu Jabra, would help David Fellman out and, at first using sign language, taught him how to work the land. When Bedouins stole something from the orange grove, Abu Jabra fined the robbers and the Fellmans donated the money to the village poor. Another time Bedouins robbed the house when the boys weren't home. The Arab neighbors heard shots and came to protect their neighbors, fighting throughout the night until they managed to fight the robbers off. Another time an Arab child drowned in the farm's water hole. Arabs gathered from near and far, and a lynch mob started forming, accusing the Jewish family of killing the boy. But the child's mother stood between them and Sarah Itta "My son was as dear to her as he was to me. Woe to whomever touches her." The older sons got married in Sumeil but once the grandchildren were school-age, they moved to the new Yaffo neighborhood of Neve Zedek. At the turn of the century, after fifteen years on the farm, Sarah Itta bowed to family pressure and moved to Yaffo. There she got involved with community and charity affairs, but she didn't leave her beloved farm - every day she would ride to Sumeil, supervise the workers and meet with her former neighbors. In 1917, towards the end of World War I, the Turks forcibly evacuated Yaffo and the new city of Tel Aviv. Though the deportation order applied to everybody, the Turks turned a blind eye to the fact that most Arabs set up camp in the nearby orange groves. The Fellmans hid their belongings in Sumeil, by Sheikh Abu Jabra. For a while they were in Kalkilyah (Qalqilya), where Sarah Itta set up a bakery for the benefit of the Jewish evacuees. They then moved north and settled in Tiberias, where one of the sons ran the concession stand in the Zemach (Samakh) train station. In the 1930s, as the city of Tel Aviv grew, the agricultural land of Sumeil became valuable real estate. The Fellmans, like their Arab neighbors, were offered a lot by builders. In 1936, shortly after the family sold the farm, Sarah Itta passed away. 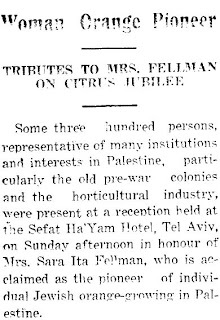 In 1934, the city of Tel Aviv celebrated the 50th anniversary of the establishment of the Fellman farm. 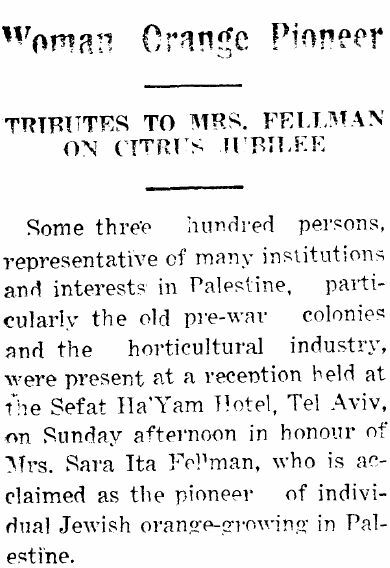 Hundreds of dignitaries came from across the country and Mayor Meir Dizengoff and the city council crowned Sarah Itta "the pioneer of Hebrew citrus farming". Anybody who visits Tel Aviv can visit the Fellman farm - today hidden under Rabin Square, the Tel Aviv municipality, Gan Ha'ir and dozens of apartment buildings - and honor the first Jews who lived here, who put Torah above everything, and who were convinced that Redemption will only come by buying land, planting an orchard and sticking it through. Nathan Hale, the American patriot will forever be remembered with those words as he went to his death by hanging. The Islamic Jihad terror group has the distinction of being the first Palestinian terror group to launch a Suicide Bomber against Israel, Bus 405 in 1989. Killing 16 people. An offshoot of the Muslim Brotherhood (those guys who just took over Egypt), the Palestinian Islamic Jihad have been one of the most violent and deadly of the rainbow of terror groups that make up the Palestinians. Because one of their leaders, Sheihk Khader Adnan is being held in Administrative Detention by the Israeli government. He has gone on a hunger strike demanding his release. He is currently on day 67, and if we're lucky, he'll reach 70 days and die. This Islamic Jihad leader has gained followers all over the world demanding his release. Just so you understand, Islamic Jihad is the Palestinian equivalent to Al Quida. Khader Adnan, as an Islamic Jihad leader, has accountability for his association and leadership in that major terror organization. Islamic Jihad said they will launch attacks on Israel if their terrorist Adnan dies from starvation. We know the Israeli government will probably fold under the world's pressure, but one can still hold on to the faint hope that it won't, and Adnan can go the way of the Dodo, even if unfortunately it's quietly in a bed. Chilul Shabbat in Tel Aviv - Public Buses to start? How times have changed. 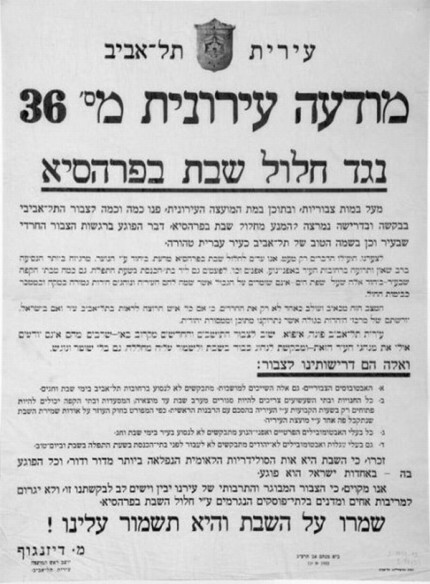 The Tel-Aviv municipality poster below was signed by Meir Dizengoff, the first mayor of Tel-Aviv, imploring the residents to not publicly desecrate Shabbat. "Observe the Shabbat and it will protect you!" The Tel Aviv city council decided Monday to seek a Transportation Ministry permit to run buses on Shabbat. The city's Mayor, Ron Huladi, has supported the move for a while now. During Monday's discussion he said: "Those who don't want to get on a bus (on Shabbat) can choose not to board it." According to a decision approved by city council, the municipality will now draft a detailed request and submit it to the Transportation Ministry. R' Chaim Navon poses the question: Who is saying the following in Israel? Who are you to tell us what to do? All the riders on the bus want this solution! If you don't like our solution, don't get on the bus. - the Ultra-Orthodox Chareidim who want women in the back of the bus, men in the front, or segregated buses altogether? R' Navon writes a thoughtful article about how we in Israel need to find better ways to compromise on issues of religion. Today, everything is a war -- on both sides of the spectrum. 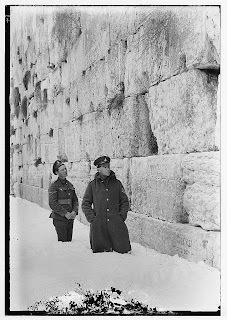 Due to the Jerusalem snow storm that wasn't, here's a story of a snow storm that was. In 1787, on the week of Parshat Beshalach, a major snow storm hit Jerusalem. 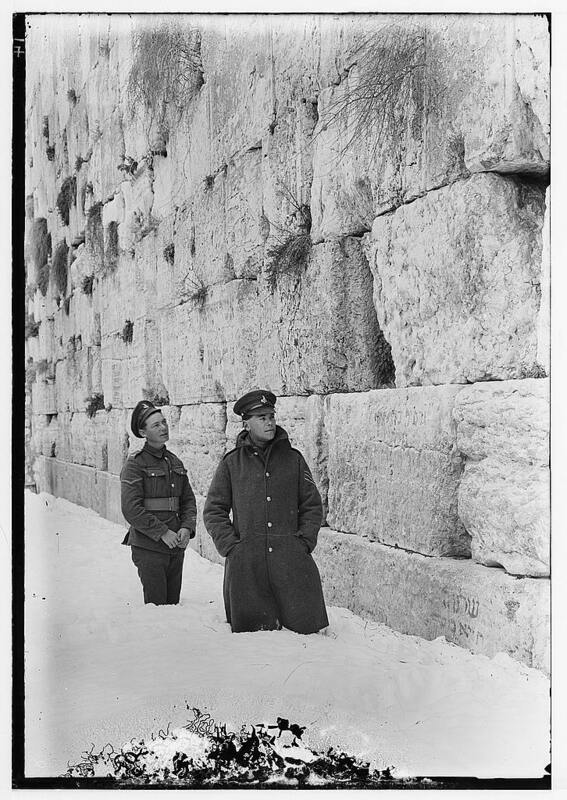 Starting on the Wednesday of that week (Jan. 31 - 12th of Shevat), and for three whole days, it snowed and snowed. The snow piled up in the streets man-high, covering up the doors and preventing people from going out. The gates of the city, usually open during the day, remained shut. Rabbi Moshe Yosef Mordechai Meyuchas, the Chief Rabbi of Jerusalem at the beginning of the 19th century, describes it as "something like we've never seen, and never been told by our fathers". The snow was so heavy that the roof of the Istanbuli Synagogue collapsed. The Ottoman authorities did not allow the Jews to rebuild the roof, and it was only in 1835, under the rule of Muhammad Ali Pasha, that the synagogue was repaired. Come Shabbat (Tu Bishvat) the Jews were faced with a problem. The synagogues were low, impossible to access, and remained closed. Will they have to go a Shabbat without reading the Torah? Luckily, there was one building which was high and accessible: the Kabbalist Bet El Synagogue (Yeshivat haMekubalim). Rabbi Yom Tov Elgazi, the Chief Rabbi of Jerusalem and head of the Bet El Yeshiva, managed to get together 2-3 minyans and read the Torah. Rabbi Meyuchas says that he himself lived far from the 'street of the Jews'. He had a Torah scroll at home, but could only get together eight men, not enough for a minyan. They had to pray the morning Shabbat prayers without reading the Torah. They then sat down together for the Shabbat morning meal. However, later in the day, sometime around noon, Rabbi Meyuchas got a heaven-sent gift: two golden Torah ornaments. He used the ornaments to complete the minyan, and the group read the Torah. Learn to Shoot at Calibehttp://www.blogger.com/img/blank.gifr-3 with top Israeli Anti-Terror Experts! 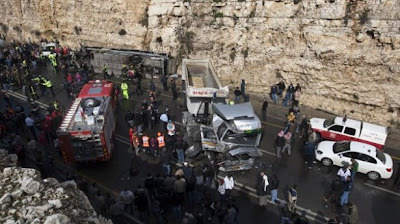 There was a tragic bus accident this morning near Jerusalem -- a Palestinian school bus hit a truck, causing the bus to flip over and catch on fire. The Palestinian Red Crescent hasn't made up its mind yet about the number of casualties, but between 6-8 children were killed and dozens injured -- some seriously. Yet immediately after the tragedy, the Palestinian Authority's Health Minister, Dr. Fathi Abu Morley called a press conference in Ramallah, blasting Israel for "not responding in time"
The Palestinian's lie is simply and absolutely disgusting. As a first responder medic for both Magen David Adom and United Hatzalah emergency response medical services, I received a MDA emergency pager message at 9:13 AM this morning, that a school bus had flipped over and a mass casualty incident was declared. Moments later I received an SMS from United Hatzalah, calling on all emergency medical personnel in the area to respond. I switched to channel 1 on my United Hatzalah cellular radio, and heard dozens of first responders announcing they were on their way to the scene of the accident. No one even mentioned that it was a "Palestinian school bus" -- since that was completely irrelevant. Israel's emergency medical services respond 24 hours a day, 7 days a week to every car accident and medical emergency -- regardless of who is in need. Israel provides the best professional, emergency medical support, period. Yet the Palestinian Authority's Health Minister can't contain himself, and he has to lash out at Israel, as he lies and lies. Coincidentally (or not), yet another symptomatic chronic Arab lie was debunked today. The French Supreme Court on Wednesday acquitted an Israeli doctor accused of slandering a Palestinian man who claimed he was injured by the IDF during the second intifada. The Palestinian man, Jamal al-Dura, and his 12-year-old son Muhammad, became the symbol of the Al-Aqsa Intifada, when the two were caught in a fire exchange in the Netzarim Junction. The boy was killed in the incident, triggering a blame game: The Palestinians accused Israel for Muhammad's death, while Israeli officials claimed he was hit by Palestinian fire. Al-Dura decided to sue David, and last year a Paris court ruled against the doctor due to the fact he released information from al-Dura's medical records. He was ordered to compensate al-Dura with €13,000, but decided to appeal the ruling at the French Supreme Court. "It couldn't have turned out better," David told Ynet after the ruling was overturned. "It means that I spoke the truth, and the father just lied. "We managed to deconstruct their false statements. All the scientific evidence that we collected for the past 12 years proves that the incident was staged and fake. They made up the father's injury, and the IDF troops never shot the boy." To understand more of why Palestinians and Arabs are chronic liars, I suggest you read yesterday's post, "An Arab like Me"...in which an Arab stands up, and has the guts to spell out the truth. 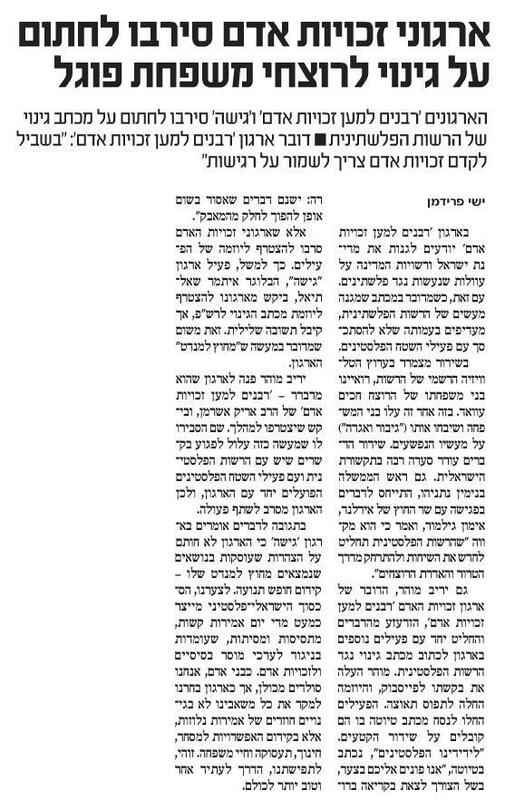 In a fascinating article, published on the Kikar Shabbat website, a man, "Aharon" announces that he has decided to donate a year of his life, to the great Torah scholar, R' Elyashiv, who is currently very ill.
"I discussed this with the Torah Giants of our generation, and they told me to ask my wife and children." This is a very unusual gesture and Aharon explained what brought him about to make this decision. "We are in an era when the great Torah leaders of Israel are the backbone of our existance, and without them, we would not be able to watch over our lives." 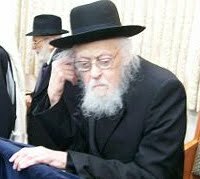 The serious medical condition of the "posek hador", R' Yosef-Shalom Elyashiv, is causing many to lose sleep. In addition to the prayer vigils held almost every night, there are those who took upon themselves, as a personal project, additional Torah study, so that in the merit of their study, R' Elyashiv will have a full recovery. children agreed immediately. Rabbis encouraged me to accept this upon myself through prayer, without a special ceremony. Is there a refund, if R' Elyashiv doesn't have a complete recovery? Is there are Jewish source for such a deal? Does G-d approve of such deals? In the future, I can imagine a PONZIE scheme -- people donating a year of their lives to the person a level above them, so that the person at the top of the pyramid attains the life span of thousands of years, while those on the bottom are left having given away years of their lives? May R' Elyashiv have a complete recovery, even without this "donation..."
Labels: donation, R' Elyashiv, year of one's life. The following Op-Ed piece really resonates right. Lee Habeeb writes about Arabs...and about Israel without prejudice, without political correctness. Worth a read. Too bad he will probably be bashed by liberals for being a "self-hating" Arab. He goes directly to the point, explaining how seemingly intelligent Arabs lose their marbles when it comes to Israel. Read it all here. Maybe one day there will be more people like him. On Tu Bishvat we were visited by a youth group who came to plant trees. 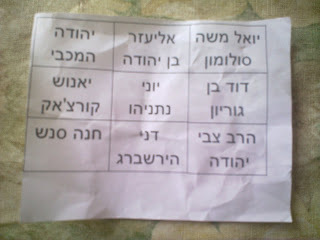 One of the groups had been playing Israeli Bingo on the way, with each card listing important people from Israeli history. Not surprisingly, 99% of the names on the bingo cards were either pre-Exile or Zionist-era people. Therefore, I thought I'd use the opportunity to list some of the more well-known Israeli writers, scholars and leaders throughout the ages. Maybe next time I'll find their names on school-children's bingo cards. Our early poets (4th-10th centuries) - Jose b. Jose, Yanai, Eleazar Kalir. 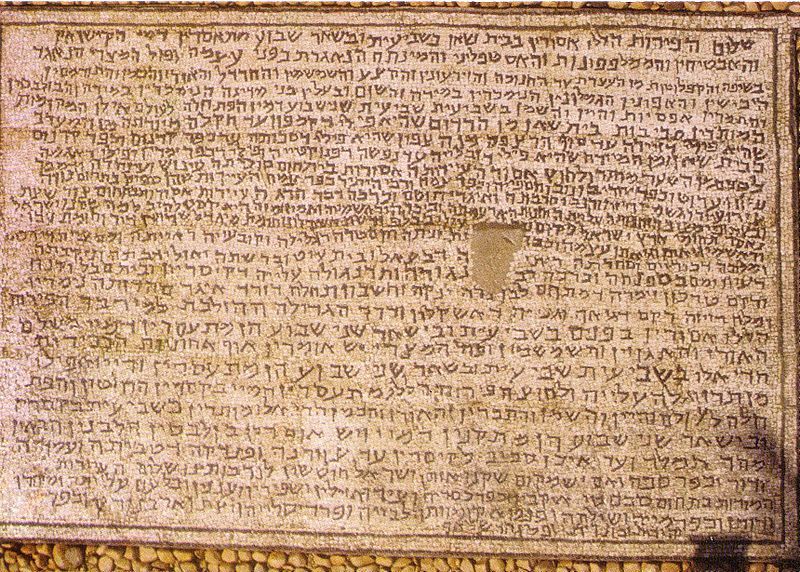 Wrote many of the religious hymns in Ashkenazi prayer books. Aaron ben Asher (10th century) - Bible Masorah authority. Added the masorah notes to the Aleppo Codex, the basis for all our Bibles today. Judah Halevi (12th century) - poet and philosopher, author of the Kuzari, believed that true religious fulfillment is only possible in Israel. Samson ben Abraham (Rash of Sens, 12th century) - one of the leading French Tosafists, led the first wave of the Tosafist Aliyah in the early 13th century. Dona Gracia Mendes Nasi (16th century) - the 'first Zionist', leased the area of Tiberias to create an autonomous Jewish region. Rabbi Isaiah Horowitz (Shelah ha-Kadosh) (17th century) - Mussar (ethics) scholar who greatly influenced the Hassidic movement. Yisroel ben Shmuel Ashkenazi of Shklov (19th century) - student of the Vilna Gaon, Wrote the "Pe'at Hashulchan" on the laws of the land, helped rebuild the Hurva synagogue. Israel Beck (19th century) - First Israeli printer in the modern era, established the first Jewish agricultural village (on Har Meiron). Rabbi Yechiel Michal Pines (19th century) - one of the fathers of religious Zionism. The Muqata hereby announces that it cannot confirm or deny any Israeli involvement in today's explosion in Iran. And we also adopy the same policy with regard to this HuffPo article from today. On Saturday night, my 6th grade daughter notified me she was going over to a girlfriend's house for the night, to study for an upcoming exam in English. As the daughter of "Anglo" parents, she studies English in a special class -- 'English for English Speakers." Over the years, my kids have been in this advanced class, yet they still (unfortunately) lag behind their counterparts in the US. While their English is excellent from an Israeli point of view, they aren't on the same level as if they lived abroad. A small price to pay for living here. Yet when I asked my daughter about what was on her upcoming exam, her reply came as an unexpected, refreshing shock. "I need to know about the 3 branches of the American Government, the preamble of the US Constitution, the 5 freedoms in the first amendment, and the first 10 amendments of the "Bill of Rights." I don't remember having to know that in 6th grade in the US...maybe in 7th grade or later. I was thrilled to be able to review with her the system of "checks and balances" of the US government, explain what a "jury of peers" is, and the importance of the freedoms granted by the "Bill of Rights." "Bearing Arms" and "quartering soldiers" were new words and concepts that she had never heard of before. Since it wasn't easy for a non-native English speaker like my daughter to memorize all of the above, I found "Schoolhouse Rock" videos from youtube that help explain the above in song form. 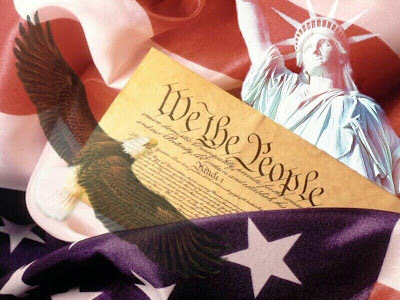 We made up a rap song called "RAPPS" -- for the 5 freedoms in the first amendement, "Religion, Assembly, Press, Petition and Speech"
Kudos to my daughter's English teacher who aims higher when educating our kids in Israel -- there is so much to learn and appreciate from the USA's democracy, government and legal system. Its a shame that Israelis who aren't in my daughter's "English for English Speakers" class are never formally exposed to such concepts -- Israel has a long way to go before we can match the freedoms and democracy in the US. Maybe we'll get there one day. What was the Jewish Press thinking? The JewishPress.com has been taking some very controversial positions lately, but what were they thinking with this cartoon? Yet, I admit there's a logic to it. The Arab Spring is turning into an Arab Winter. The Arab states which were stable (to the West) but killed and mistreated their citizens, are now unstable, and will continue to kill and mistreat their citizens, this time under the guise of Moslem Fundamentalism, rather than Secular Dictatorship. But this cartoon implies approval that Russian and China put stability first before the basic rights of Syrian citizens to choose their own oppressors. Here at the Muqata, we said removing the dictatorships was a good thing, but most likely we'd get Muslim fundamentalists in return and that would be a bad thing. Maybe this JewishPress.com cartoon isn't so far off after all. Tu Bishvat (the 15th of Shvat), the holiday celebrating the fruit of Israel, has ancient Israeli roots, though we wouldn’t know about them if not for the Cairo Genizah. The date itself is first mentioned in the Mishnah, as the “New Year of the Trees”. This “new year” was not a holiday; rather just a date for determining when the year starts for the purpose of tithing the fruits. The day became a holiday by the Jews of Israel sometime in the Muslim period (7th-11th centuries). Manachem Zula’i, a scholar of the ancient Israeli Piyyut (religious hymn), found three Tu Bishvat Piyyuts written by Rabbi Yehuda Halevi ben Hillel (Reprinted in Tehilla Le-David). In those days the prayer service was flexible and the piyyut was added on to the basic prayer format. Two of the piyyuts found in the Genizah are Shmone Esre prayers, meant to substitute the regular texts during the chazzan’s repetition. One piyyut mentions an alphabetical list of Israeli plants, which includes various nut trees (almonds, walnuts, chestnuts), grapevines, olive, pomegranate, carob and various herb plants like myrtle and lavender. In the Israeli-Babylonian schism, the Jews of Ashkenaz continued the traditions of Israel, while the Sephardi Jews upheld the Babylonian tradition. Indeed, the tradition of celebrating Tu Bishvat as a holiday continued on in Ashkenaz. For example, one of the earliest Ashkenazi rabbis, Rabbeinu Gershom (early 11th century), wrote that the public may not fast on Tu Bishvat. This tradition was accepted by the Sephardi community in 16th century Safed (Zfat), and codified by Rabbi Yosef Caro in the Shulchan Aruch. Another Ashkenaz holiday tradition is described by Rabbi Issachar ben Mordecai ibn Susan, a 16th century Sephardi Jew who lived in Safed. He wrote that the local Ashkenazi Jews had a tradition of eating fruit on that day. This tradition was also mentioned in a European book of customs from that era. This tradition was quickly adopted by the local Sephardi community as well. Rabbi Moses Galante, the Safed-born Chief Rabbi of Jerusalem in the 17th century, and other rabbis would celebrate the occasion with a ceremonial meal: eating fifteen different types of fruits, learning a Mishnaic passage over each, and by praying that this year will be a blessed one for both the children and fruit of the land. This tradition is described by his grandson, Rabbi Moses Hagiz. This ceremony was popularized in the early 18th century, by the Kabbalistic work “Hemdat Yamim” . "Hemdat Yamim" formulated a Tu Bishvat ‘Tikkun’ ceremony, which emphasized the reciting of numerous blessings and verses on a variety of fruit. This ceremony was based on the Kabbalistic writings of the students of Rabbi Isaac Luria, the ARI, on the spiritual categories of the different fruits, and that in turn was based on the ancient Israeli midrash. This tradition later evolved into the ‘Tu Bishvat Seder’, which celebrates the fruit of the land and was accepted by Sephardi Jews worldwide. The holiday further developed in the late 19th century: In 1890 Zev Yavetz, teacher and historian, proposed to make Tu Bishvat a national tree-planting holiday. The idea was widely accepted and is still practiced today all over Israel. This article is based on Avraham Yaari’s article in Machanayim, vol 42, 1960. 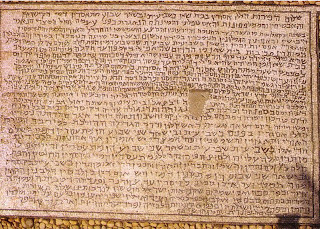 “Hemdat Yamim” was published in 1731 based on a manuscript from Safed. The author is unknown. There are various theories as to who it might have been, and which place him in the late 17th or early 18th century. 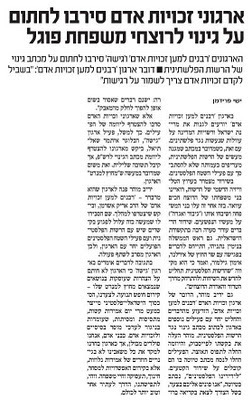 The following is a translation from an article in the Makor Rishon newspaper (seen on right), with additions by Jameel. The organization "Rabbis for Human Rights’ knows exactly how to condemn the State of Israel and its authorities for any action against a Palestinian. Yet, when it comes to a letter which condemns the actions of the Palestinian Authority, the Rabbis for Human Rights would prefer not to be in conflict with Palestinian activists. In a terrifying broadcast on Palestinian Authority official TV, the family of the convicted terrorist Hakim Awwad [murdered of the 5 members of the Fogel family] was interviewed. One after another, the family members were interviewed, each one praising the "hero and the legend" for his barbaric acts. The broadcast created a storm within the Israeli media. Even Israel's Prime Minister, Benjamin Netanyahu mentioned this to Ireland's Foreign Minister, Eamon Gilmore and said he hopes the Palestinian Authority will decide to restart the talks with Israel and abandon the path of terror and praising murderers. Yariv Mohar, the spokesperson for Rabbis for Human Rights was outraged at the broadcast, and decided with other members of his organization to start a Facebook page which condemns the Palestinian Authority’s broadcast and the initiative started to gain popularity. The activists wrote "To our dear friends, the Palestinians, we turn to you in pain because of the need to clearly announce that there are things which may never be part of a struggle." Unfortunately, other "Human Rights" activists refused to join the initiative. 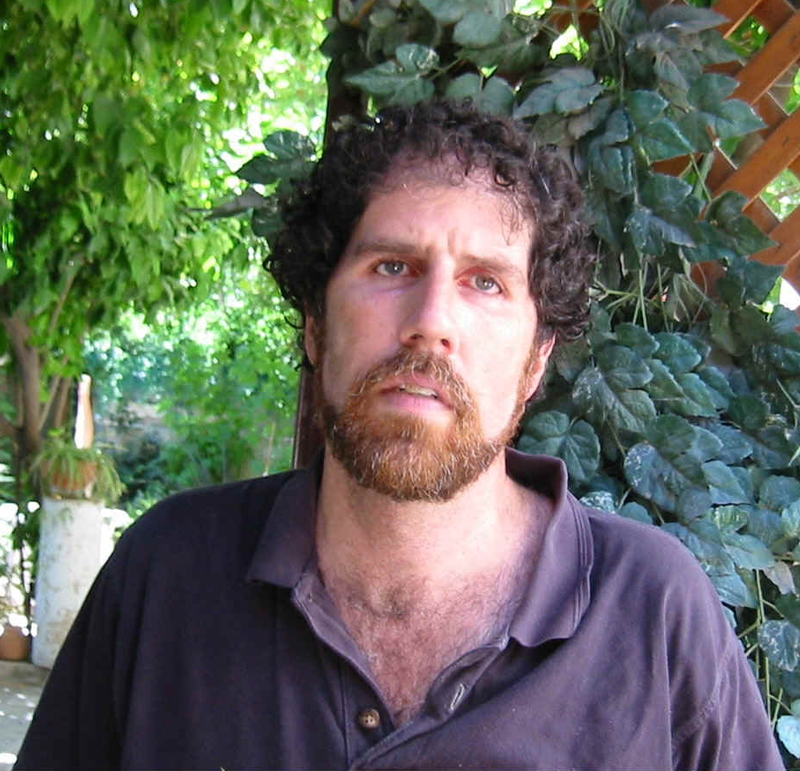 For example, a member of the "GISHA" organization, Blogger Itamar Goldstein asked his organization to join the initiative, signing a petition which condemns the action of the Palestinian Authority, yet he received a negative reply that [joining the petition] was outside the mandate of the organization. Yariv Mohar turned to the organization he is spokesman for, "Rabbis for Human Rights" -- led by Rabbi Arik Asherman [pictured on right], and asked for them to join the initiative. It was explained that such an action [as joining the petition] could possible negatively impact the organization’s relationship with the Palestinian Authority, and Palestinian activists -- and therefore the organization refused to cooperate. In response, the "GISHA" organization announced that their organization does not sign any petition outside its mandate which encouraging "freedom of movement." "Unfortunately, the Israeli-Palestinian conflict creates harsh statements on a daily basis which incite, and are in contradiction to basic moral ethics and human rights. We abhor them all, yet as an organization; we have chosen to focus all our energy -- not in condemning statements, but in progressing commerce, education, and family life. In our opinion, this is the best way to a better, different future for everyone." We send our condolences and pray that God will send consolation to the surviving members of the Fogel family. Yet, he finds it ethically and morally challenging to condemn the Palestinian Authority which broadcasts programs which praise the same murderers. I guess educating Palestinians to hate is a good thing...despite his initial objection. The following appocolyptic video has been making the rounds (was only uploaded 3 days ago to youtube). Description: In February 2013 the Republic of Iran opened a combo attack culminating in the dropping nuclear bombs on Israeli﻿ territory and the environment. This is one of many records that survived from that day that changed the world. The video is fiction, and it's incredibly unlikely that Iranian warships will be bombing Israel. Yet the possibility that such an attack could happen still exists. Imagine showing a movie like this the week before Yom Kippur in 1973. Everyone would call it stupid, fear-mongering propoganda. So, is this film today, also stupid, fear-mongering propoganda? 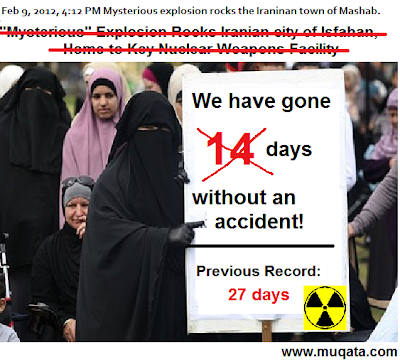 Iran outwardly calls for Israel's destruction, and is progressing their nuclear program. Does Israel's leadership have the foresight to prevent this?